Resocialization is the process by which one's sense of social values, beliefs, and norms are re-engineered. This process is deliberately carried out in a variety of settings such as in many single parent households and military boot-camps, through an intense social process that may take place in a total institution. An important thing to note about socialization is that what can be learned, can be unlearned. This forms the basis of resocialization: to unlearn and relearn. Resocialization can also be defined[by whom?] as a process wherein individuals, defined as inadequate according to the norms of a dominant institution, are subjected to a dynamic redistribution of those values, attitudes and abilities which would allow them to function according to the norms of said dominant institutions. This definition relates more to a jail sentence. 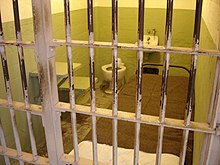 If individuals exhibit deviance, society delivers the offenders to a total institution where they can be rehabilitated. Resocialization varies in its severity. A mild resocialization might be involved in moving to a different country. One who does this may need to learn new social customs and norms such as language, eating habits, dress, and talking habits. A more drastic example of resocialization is joining a military or a cult, and the most severe example would be if one suffers from a loss of all memories and therefore would have to relearn society's norms over again. The first stage of resocialization is the destruction of an individual's former beliefs and confidence. A total institution refers to an institution in which one is totally immersed and that controls all the day-to-day life. All activity will occur in a single place under a single authority. Examples of a total institution can include prisons, fraternity houses, and the military. The goal of total institutions is resocialization which radically alters residents' personalities through deliberate manipulation of their environment. Resocialization is a two-part process. First, the institutional staff try to erode the residents' identities and independence. Strategies to erode identities include forcing individuals to surrender all personal possessions, get uniform haircuts and wear standardized clothing. Independence is eroded by subjecting residents to humiliating and degrading procedures. Examples are strip searches, fingerprinting and assigning serial numbers or code names to replace the residents' given names. The second part of resocialization process involves the systematic attempt to build a different personality or self. This is generally done through a system of rewards and punishments. The privilege of being allowed to read a book, watch television or make a phone call can be a powerful motivator for conformity. Conformity occurs when individuals change their behaviour to fit in with the expectations of an authority figure or the expectations of the larger group. Resocialization is also evident in individuals who have never been "socialized" in the first place, or who have not been required to behave socially for an extended period of time. Examples include feral children (never socialized) or inmates who have been in solitary confinement. Sociologist Erving Goffman studied resocialization in mental institutions. He characterized the mental institution as a total institution—one in which virtually every aspect of the inmates’ lives was controlled by the institution and calculated to serve the institution's goals. For example, the institution requires that patients comply with certain regulations, even when compliance is not necessarily in the best interest of the individual. Boot camp serves as an example for understanding how military members are resocialized within the total institution of the military. The purpose of military training, like boot camp, is to “promote the willing and systematic subordination of one’s own individual desires and interests to those of one’s unit and, ultimately, country." To accomplish this, all aspects of military members’ lives exist within the same military institution, are controlled by the same “institutional authorities” (drill instructors) and are done to accomplish the goals of the total institution. The individual’s “civil[ian] identity, with its built-in restraints is eradicated, or at least undermined and set aside in favor of the warrior identity and its central focus upon killing." Military training prepares individuals for combat by promoting traditional ideas of masculinity, like training individuals to disregard their bodies’ natural reactions to run from fear, have pain or show emotions. Although resocialization through military training can create a sense of purpose in military members, it also has the likelihood to create mental and emotional distress when members are unable to achieve set standards and expectations. In the first couple of days, the most important aspect of basic training is the surrender of their identity. Recruits shed their clothes and hair which are the physical representation of their old identities. These processes happen very quickly and allows no time for recruits to think over the loss of their identity, this is so the recruits don’t have a chance to regret their decisions. The drill sergeants then give the young men and women a romanticized view on what it is to be a soldier, and how manly it is. When the training starts it is physically demanding and gets harder every week. The recruits are constantly insulted and put down; this breaks down their pride and destroys their ability to resist the change they are undergoing. The drill sergeants put up a facade that tells their recruits that finishing out basic training sets them apart from all of the others who will fail. However, almost all recruits will succeed and graduate from basic training. The training is also set up with roles. There are three younger drill sergeants closer to the recruits in age and one senior drill sergeant who becomes a father figure to the new recruits. And the company commander plays a god-like role, that the recruits look up to. The people in these roles will become role models and authority figures, but will also help create a sense of loyalty to the entire organization. Recruits are made to march in a formation where every person is moving the same way at the same time causes a sense of unity. It makes the recruits feel less like an individual and more like they are a part of a group. They sing in cadence to boost morale and to make the group feel important. The drill sergeants also feed the group small doses of triumphs which keep the soldiers proud and feeling accomplished. The troop also undergoes group punishment which unifies the unit. Generally the similar hatred of something will bring everyone together. In this case, group punishment allows all the recruits to hate the drill sergeants and the punishment but find unity within their unit. They will encourage others to push themselves and create shared hardships. Prisons have two different types of resocialization. The first type is when the prisoner has to learn the new normal behaviors that apply to their new environment. The second type is if the prisoner has to partake in rehabilitation measures to help fix their deviant ways. When the individual violates the dominant society’s norms, the criminology system subjects them to a form of resocialization called criminal rehabilitation. Rehabilitation aims to bring an inmate's real behavior closer to that of the majority of the individuals' behaviour that make up the dominant society. This 'ideal' societal behaviour is highly valued in many societies, mainly because it serves to protect and promote the well being of the majority of that society's members. In rehabilitation, the system will strip the criminal of his prior socialization of criminal behavior including the techniques of committing a crime and the specific motives, drives, rationalizations and attitudes. Criminal behavior is learned behavior and can therefore be unlearned. The first step towards rehabilitation is the choice of Milieu. This is the type of interactions the deviant will have with the people around him while in custody. Usually this is determined after psychological and sociological screenings are performed on the criminal. The second step is Diagnosis. The diagnosis is a continual process influenced by feedback from the individual’s behavior. The next stage is treatment. Treatment is dependent on the diagnosis. Whether it is treating an addiction or redefining the values of a person, the treatment is what will resocialize the criminal back to societal norms. ^ Dunivin, Karen (1994). "Military Culture: Change and Continuity". Armed Forces and Society. 20 (4): 531-547. ^ Bradley, Christopher (2007). "Veteran Status and Marital Aggression: Does Military Service Make a Difference?". Journal of Family Violence. 22 (4): 197-209. ^ Herbert, Melissa S. (1993). "From Crinoline to Camouflage: Initial Entry Training and The Marginalization of Women in The Military". Minerva. 11 (1): 1-11. ^ Fox, John; Pease, Bob (2012). "Military Deployment, Masculinity and Trauma: Reviewing the Connections". The Journal of Men's Studies. 20 (1): 16-31. ^ Hinojosa, Ramon (2010). "Doing Hegemony: Military, Men, and Constructing a Hegemonic Masculinity". The Journal of Men's Studies. 18 (2): 179-194. Conley, Dalton. You May Ask Yourself: An Introduction to Thinking like a Sociologist. New York: W.W. Norton, 2011. Print. Ferguson, Susan J. Mapping the Social Landscape: Readings in Sociology. Boston: McGraw-Hill, 2002. Print. Kennedy, Daniel B., and August Kerber. Resocialization, an American Experiment. New York: Behavioral Publications, 1973. Print. This page was last edited on 22 February 2019, at 08:09 (UTC).